In 2007, Reese Witherspoon looked absolutely beautiful in an eggplant colored gown by Nina Ricci, but what everyone remembers is the bangs that launched a million copycats. Reese opted out of a traditional updo and went for a glammed-up, ultra-straight style with perfect fringe. Woman all over were rushing to their stylists on Monday asking for those very bangs. I tend to favor the unexpected on the red carpet, which is why I loved Anne Hathaway‘s wavy ponytail at the 2008 Academy Awards. She paired it with this dramatic gown by Marchesa. Anne always looks amazing at the Academy Awards. She’s one to watch tonight! 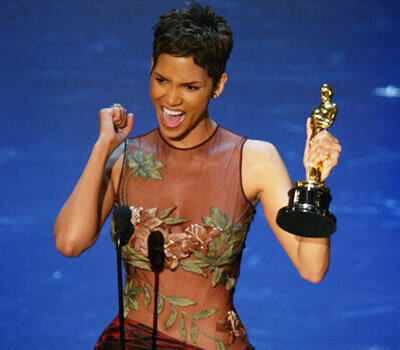 In 2002, Halle Berry gave a memorable Oscar acceptance speech, but what stands out t me is her amazing pixie. Michelle Williams‘ 2006 Oscar look will always hold a special place in my heart. I remember watching the red carpet with a room of girls, and we all gasped when Michelle and Heath Ledger came on screen. Her bold dress choice (Vera Wang again), red lip, and wavy, undone updo were all unexpected and gorgeous. I’ll always remember this look. Six more of my favorite Academy Award looks, after the break! Another all-time favorite: Nicole Kidman‘s scarlet Balenciaga from 2007. I adore this high, halter neckline on her, and that dramatic bow in the back. She looks every inch the iconic movie star. And her super sleek hair is perfection. Marion Cotillard‘s 2008 mermaid inspired Jean Paul Gaultier dress was probably the most discussed and polarizing dress of the year. There’s no middle ground with this look–you love it or you hate it. But her cascade of waves is an equal opportunity crowd pleaser. In 2006, Jada Pinkett-Smith wowed the crowd with this sleek and simple ‘do, perfectly accenting her electric blue gown. Also, I get the feeling Jada works out. What do you think? Charlize Theron was the epitome of old Hollywood glamour at the 2000 Academy Awards. Her pin curl hairstyle perfectly accents the vintage inspired Vera Wang gown. Who wears yellow to the Oscars? Cate Blanchett, of course. She wore this buttercup Valentino Couture gown to the 2005 Academy Awards, where she nabbed a statue for Best Supporting Actress. Love her curls–so fresh and different. 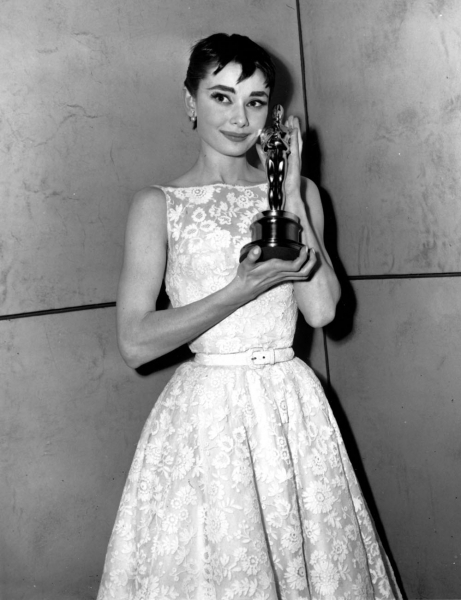 Of course, I can’t leave out Audrey Hepburn’s iconic short bang + bun look at the 1954 Academy Awards. Wearing a Hubert de Givenchy gown, Audrey shaped our very understanding of Hollywood elegance. Do you agree or disagree with my picks? And what are your all-time favorite Academy Award hairstyles? i loved michelle william’s look. her dress was so pretty and bold. it stood out among the usual sea of neutral colored dresses. Hi Audrey: I always thought Reese looked great with those bangs–they were cute on her heart shaped face. And funny about your sister!